In this work we aim to advance the translation of model-based myocardial contractility estimation to the clinical problem of quantitative assessment of the dobutamine stress exam. In particular, we address the question of limited spatial resolution of the observations obtained from cine MRI during the stress test, in which typically only a small number of cine MRI slices are acquired. Due to the relative risk during the dobutamine infusion, a safe acquisition protocol with a healthy volunteer under the infusion of a beta-blocker is applied in order to get a better insight into the contractility estimation using such a type of clinical data. The estimator is compared for three types of observations, namely the processed short axis cine stack contiguously covering the ventricles, the short axis stack limited to only 3 slices and the combination of 3 short and 3 long axis slices. A decrease of contractilities in AHA regions under the beta-blocker infusion was estimated for each observation. The corrected model (by using the estimated parameters) was then compared with the displacements extracted from 3D tagged MRI. The authors acknowledge the support of Engineering and Physical Sciences Research Council EP/H046410/1, British heart foundation grant NH/11/5/29058 and Cardiovascular Healthcare Technology Cooperative. 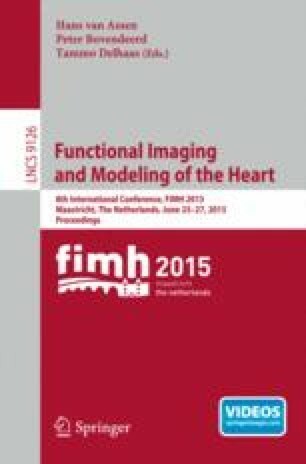 In addition, the author are thankful to P. Moireau and D. Chapelle (Inria, France) for providing the HeartLab software library, used in this work for all modeling and estimation computations, and to D. Rueckert and W. Shi (Imperial College London, Ixico) for providing the IRTK based motion tracking and valuable discussions. This research was supported by the National Institute for Health Research (NIHR) Biomedical Research Centre at Guy’s and St. Thomas’ NHS Foundation Trust and King’s College London. The views expressed are those of the author(s) and not necessarily those of the NHS, the NIHR or the Department of Health.